Search.smokycap.com is the PUP that uses misleading techniques to prevent removal. Use Reimage to locate malicious components and get rid of them faster than with uninstall instructions. A full system scan blocks virus reappearance and prevents traffic to malicious domains. Why using Search.smokycap.com search engine might be a bad idea? How did you infect your PC with this hijacker? How to remove Search.smokycap.com hijacker? Search.smokycap.com virus is a typical browser hijacker, but it targets Mac OS users only. However, Windows OS users should be concerned, too, because there are numerous other hijackers that are compatible with both operating systems. The aforementioned hijacker is not malicious, but it can significantly lower the performance of a web browser. Once installed, it adds tracking cookies and installs other tracking technologies to find out what the user is interested in. For example, it starts gathering information about user’s recent browsing sessions and analyzes user’s browsing history, search queries, downloads, clicks, and similar information. 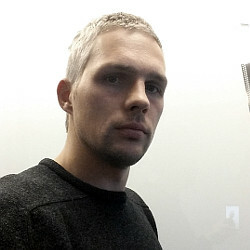 It also pays attention to the geolocation of the computer and then selects particular third-party ads for the user. These ads might appear in pop-ups, but mostly they can be encountered when using Search.smokycap.com search engine. This tool is highly untrustworthy and might not adequately disclose which search queries are sponsored and which ones are not. Therefore, clicking on these search results can take you to suspicious websites, and you never know what awaits on them. You can end up on sites that promote highly questionable programs, files, ask to fill out surveys that require personal information, and so on. Some untrustworthy sites provide dangerous links, which can lead to even more dangerous Internet pages, so be very careful what you click on. In our opinion, you should not take risks and use a different search engine instead. To remove Search.smokycap.com redirect virus from your browser, you can use automated malware removal software like Reimage or Malwarebytes MalwarebytesCombo Cleaner, or, if you prefer, remove it manually using Search.smokycap.com removal instructions that are placed below the article. Browser hijackers are mostly spread via software bundles, which can be downloaded from sites that provide download links to thousands of free programs. Even if you know that these programs are legitimate, be careful when installing them. Their setups typically contain a few customizable options that allow you to choose whether you want to install additional “recommended” third-party software or not. To access these customizable settings, you have to set Custom or Advanced settings for the setup instead of Default/Standard ones. Then simply remove ticks placed next to suggestions to install additional software. If you have experienced Search.smokycap.com hijack, we assume that your computer might also be infected with Genieo virus, because these programs relate to each other. To entirely clean up your PC, you should scan the system with an anti-malware program and see what hideous programs are lurking on the system. Potentially unwanted programs typically do not travel alone, so most likely your system is now infected with several PUPs or even more severe software. Therefore, we strongly recommend you to remove Search.smokycap.com virus automatically. We suggest using programs presented below. Alternatively, you can try to remove suspicious programs using these Search.smokycap.com removal instructions. 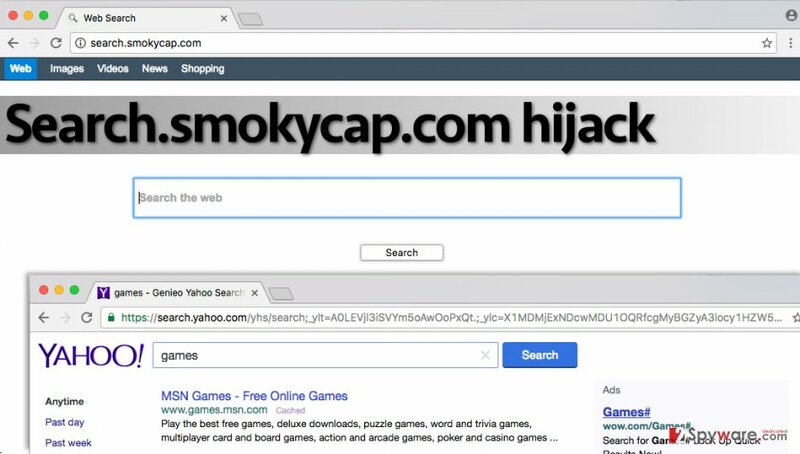 SmokyCap browser hijacker is closely related to Genieo virus, so we strongly recommend you to check your Mac for apps and browser extensions that are named similarly. Do not forget to remove other pieces of software that you cannot remember installing. Wait until you see Applications folder and look for Search.smokycap.com or any other suspicious programs on it. Now right click on every of such entries and select Move to Trash. When in the new window, check Delete personal settings and select Reset again to complete Search.smokycap.com removal. Once these steps are finished, Search.smokycap.com should be removed from your Microsoft Edge browser. Here, select Search.smokycap.com and other questionable plugins. Click Remove to delete these entries. Now you will see Reset Firefox to its default state message with Reset Firefox button. Click this button for several times and complete Search.smokycap.com removal. Here, select Search.smokycap.com and other malicious plugins and select trash icon to delete these entries. Click Reset to confirm this action and complete Search.smokycap.com removal. Here, select Extensions and look for Search.smokycap.com or other suspicious entries. Click on the Uninstall button to get rid each of them. Here, look at the Homepage field. If it was altered by Search.smokycap.com, remove unwanted link and enter the one that you want to use for your searches. Remember to include the "http://" before typing in the address of the page. Now you will see a detailed dialog window filled with reset options. All of those options are usually checked, but you can specify which of them you want to reset. Click the Reset button to complete Search.smokycap.com removal process. This entry was posted on 2016-11-11 at 02:19 and is filed under Stealing programs, Viruses. You can quickly scan the QR code with your mobile device and have Search.smokycap.com virus manual removal instructions right in your pocket. How did you remove Search.smokycap.com virus?